The first Saturday in August began in a cloudy, murky way. The air was cool, they sky was grey and I was to be leading a Mountaineers hike to a ridge near Mt Rainier where I'd had great views the week before (see post). My optimism soon kicked in, though I brought warm clothes just in case, and at 6:45 AM, I was out the door and on the way to meet my carpool. Once we organized ourselves into carpools, got the directions straight and made a potty/snack stop, we were on our way up to the trailhead. My passenger spotted sunlight; we oohed. 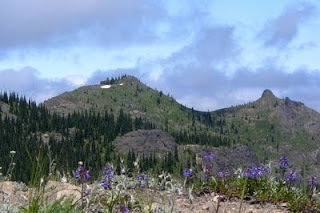 At the trailhead, there was a significant patch of blue above us, enough so that most of us were in shorts and light longsleeves or shortsleeves. 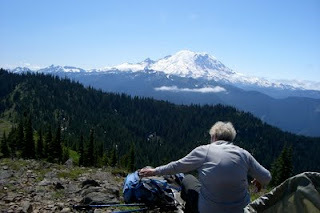 Once we attained the ridge, someone called out, "Rainier!" and there she was, clouds clearing a bit, making her look dramatic. The plan was to wander the ridge long enough so that the sun could work its magic (in the PNW, we see it so infrequently, it's not a stretch to think the sun is pure magic) and we could have lunch with a view and continue on to the high point, Noble Knob, to see the noblest of knobs, Mt Rainier. 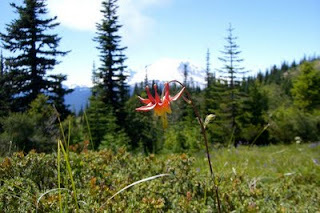 We spotted a mini-knob on the shoulder of Mutton Mountain and ascended to an open viewpoint, with flowers galore and a lovely view of Rainier. While there, the views were steadily improving, with Mt Stuart popping its head out of the clouds. We ate, we talked, we lingered, we photographed, as we were in no hurry to leave this wonderful vantage point, except that there were other vantage points to wander to. And wander we did! First, we set off for the Knob, where we ran into many other view seekers: mountain-bikers who had parked their steeds below and hiked up in their cleats (ouch), a bunch of dogs, none of them terribly friendly ( except for one otherwise sweet dog who was preoccupied with chasing butterflies) and their respective people. A big day for the Knob. 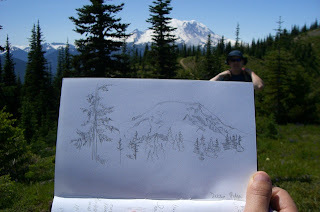 Again, my group lingered and soaked up more views, then descended and headed to the fork in the trail. 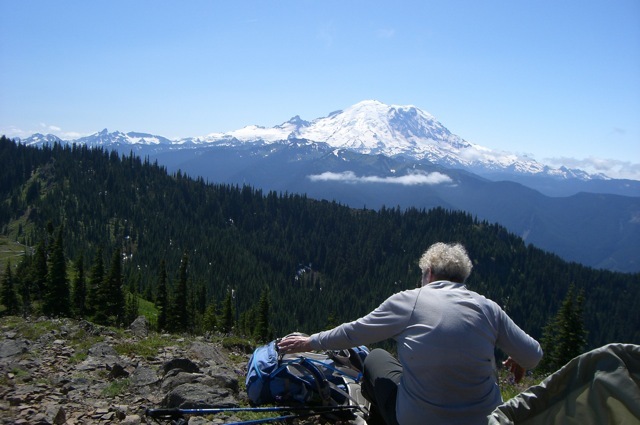 And we took it, heading southwest to the other side of the knob, below some rock formations and with a slightly different vantage point of Rainier. 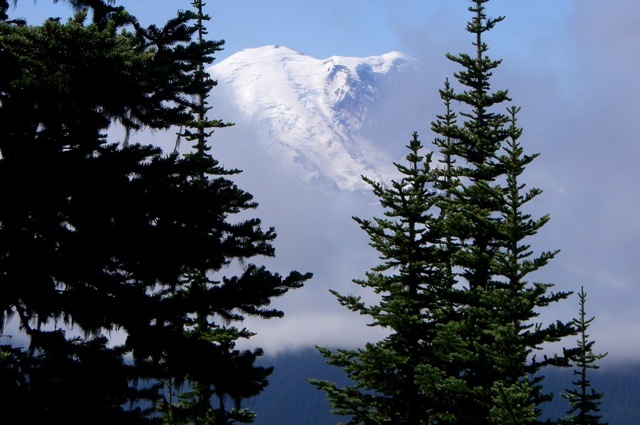 Only when we saw all we could see, did we head back toward the trailhead. Mileage for my first Hike-a-Thon hike: 8 miles, 1200' of gain. If you would like to sponsor me, donating money to WTA to keep all those trails in good shape, follow the link for my HaT page.